This 10km “runseeing” loop is a great way to see some of Luxembourg’s best sites while also getting some exercise in. The route starts off at the Buvette café near the Central train station and heads towards the Pont Adolphe bridge. When you are on the bridge, make sure you take a few moments to admire the stunning view over the Petrusse valley. The route takes you down into the lower part of the city and along the Petrusse and the Alzette river paths. At about the 5k mark, run past the beautiful St. John Church and Neumünster Abbey, continuing along the Alzette river into the Clausen district, along Rt. 218. This is where the city’s trendiest bars and restaurants can be found. 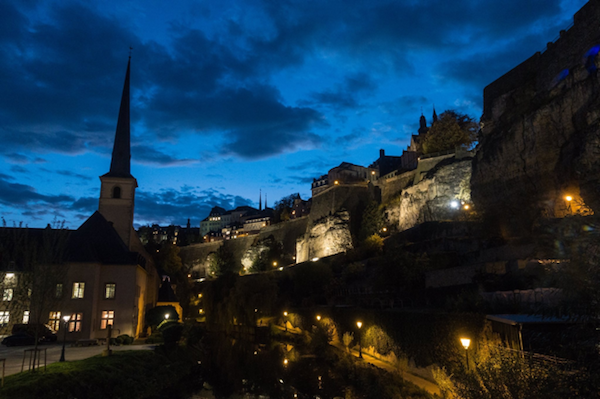 Once reaching the picturesque Old City in the Pfaffenthal quarter, the route takes you up a steep climb to reach the so-called Upper Town again. If you are not keen on hills there is the option to take the Pfaffenthal lift and re-join the route at the top. The route then takes you into the pedestrian zone of the city centre past the Grand-Ducal palace (take a few minutes to admire the impressive Renaissance style façade), through the Place de Guillaume and the Place d’Armes before heading back to the start point via the Pont Adolphe Bridge.